Save Big At The Pump With Shell's Fuel Rewards Program! 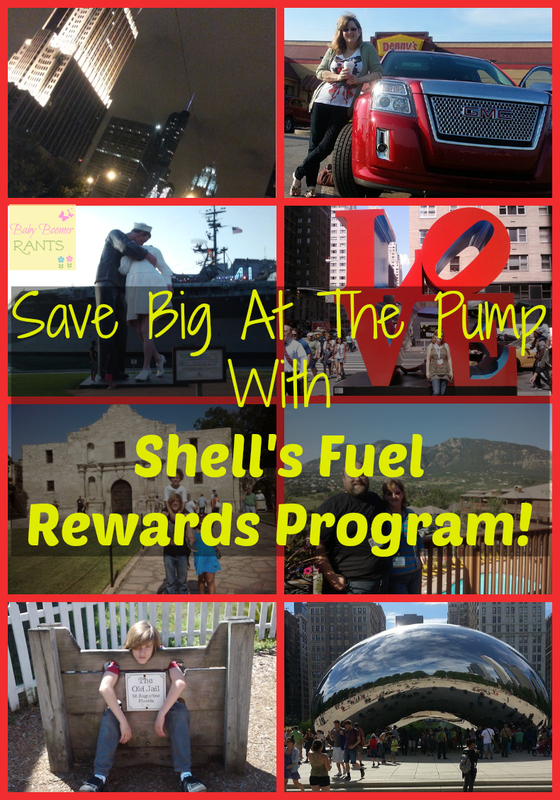 You are here: Home / Sponsored / Save Big At The Pump With Shell’s Fuel Rewards Program! Save Big At The Pump With Shell’s Fuel Rewards Program! Here’s a great opportunity to Save Big At The Pump With Shell’s Fuel Rewards Program! Who doesn’t want to save money whenever they can? With Shell’s Fuels Rewards program you can save money this summer on gas whether you are staying close to home or taking that great family vacation you’ve been planning! Do you travel in the summer? Do you do the whole family vacation thing each year? We had 4 kids and we never thought we could afford it. We were Youth pastors, so every year our family vacation was Youth Camp! lol We took the whole family to camp, young and old. That was pretty much it for family vacations in our house. It’s sad now that I think about it and now that I realize how inexpensive it can be. Now that the kids are grown, Hubby and I do a little traveling in the summer mainly to blogging conferences and we always drive. We definitely like to see the sights and take some side trips and that’s why we choose to drive instead of fly. I have shared before how we have learned to travel inexpensively. There are many ways you can cut costs when traveling, it just takes a little time and planning. One of the ways we save when we travel is by using fuel rewards, such as Shell’s Fuel Rewards program. The Fuel Rewards program is free, you can stop by any Shell station and pick up your card to get started or you can sign up online. Once you have signed up, just link up your debit and/or credit cards and start earning money off your gas purchases by doing your normal shopping and dining out! You can even link up your grocery store rewards card and earn money off your gas purchases! You can shop online as well as use ecoupons and earn. This is a great program to cut down on what you pay for gas throughout the year. Why pay more for anything? You can even earn by sharing with your friends and showing them how they can save on their gas purchases, too. When you’re ready to redeem your rewards just insert your card at the pump and redeem your savings! You can login on your pc or text FUELREWARDS to 67463 to see your savings at any time. Shell’s Fuel Rewards Program makes saving big at the pump so easy there’s no reason not to sign up and get started saving today. Whether you are vacationing or Staycationing, be sure to sign up for free to save money on your gas purchases!